If you have read my “About” page, you know I have no plan for this blog other than to write whatever comes into my head, so here goes. I am lucky enough to have two studios: One in my home in the foothills outside of Fort Collins, CO and one in town. My in-town studio is in the Poudre River Arts Center (PRAC), a re-purposed warehouse on the edge of the historic “Old Town” district of Fort Collins. Our studios were designed to be a very small imitation of the Torpedo Factory Art Center in Alexandria, VA. Upstairs we have 14 studios surrounding a wide hall. The studios have windows facing the hall so visitors can watch what the artists are doing. Downstairs, we have a small gallery and a room that we plan to make into a classroom. Our next-door neighbors in the same building are the “Center for Fine Art Photography” and a coffee shop. 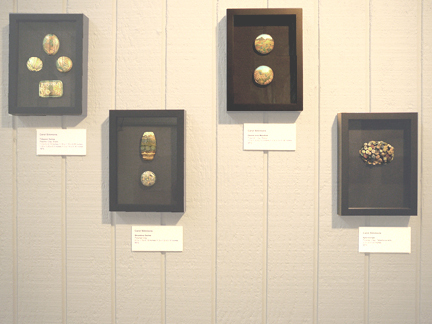 This month is the PRAC’s fourth anniversary and, to celebrate, the gallery is featuring work by the resident artists. 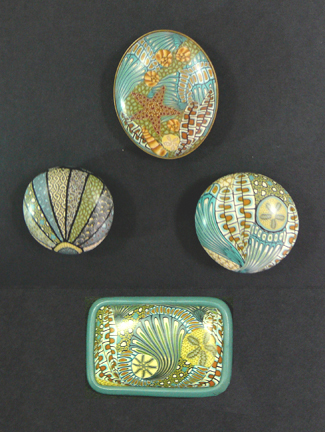 I had a hard time deciding what to put in the show, but finally settled on three small shadow boxes containing work from earlier periods in my 16-year love affair with polymer clay. A fourth box holds a piece I did specifically for the show. The picture to the right shows the boxes on the wall. The work is behind glass, so you can’t see it very well. This entry was posted in Caning, Sources of Inspiration and tagged caning, Carol Simmons, Color, Color Mixing, desert, Kaleidoscope Canes, landscapes, polymer clay, Polymer Clay Classes, Polymer Clay Colorado, Polymer Clay Teachers, Polymer Clay Techniques, Polymer Clay Workshops, Poudre River Arts Center, seascapes, sporocarps, tidepool. Bookmark the permalink. I absolutely love these beads, they are all so beautiful. Can one buy your work online anywhere? Thank you very much. For the past year I’ve been focusing on teaching, so i don’t have anything for sale right now. I recommend Premo to my students but I also have friends who are very happy with Fimo Classic. 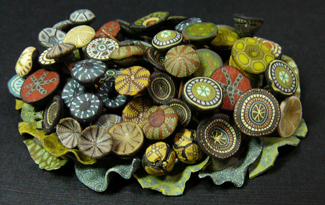 Will you be a vendor at the Rocky Mountain Bead Society show in April? (in Denver) I would love to see your work in person. No. I’ll be out of town. (I never have enough product to do shows anyway. Sorry.